Last weekend we got together with a bunch of friends from work to watch movies and share a potluck dinner, partly as a farewell to Jeremy for the fall semester. It was my job to bring desserts, and I agonized long and hard over what to bring, changing my mind several times. I didn’t settle on my menu until we were at the grocery store. Next, I made a batch each of lemon and lime bars, at Jeremy’s request. Well, he requested lemon bars and I decided to get fancy. Good thing too, because everyone seemed to prefer the lime bars. The recipe for these will be forthcoming, tomorrow maybe. 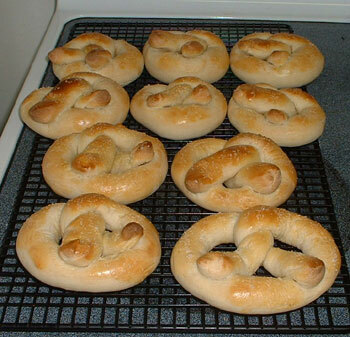 Finally, I made a batch of soft sourdough pretzels, from this recipe, to munch on during the movie. These were an out-and-out success, and seem to be perfect potluck fare to compliment a cheese/crackers/veggies snack course. I made the dough the night before, after letting my fed starter bubble most of the day, and put it in the fridge to retard overnight. Early in the morning, I pulled it out to warm and rise, so the dough was ready to roll and shape by midmorning. This was best done in several stages of stretching, so that the dough had time to relax in between. When shaped, I brushed them with egg wash and sprinkled with kosher salt, then into the oven. I should also mention that Jeremy’s contribution to the potluck was a 64oz. container of perfectly brewed loose-leaf Casablanca Twist (spring darjeeling and peppermint) iced tea. Yum! 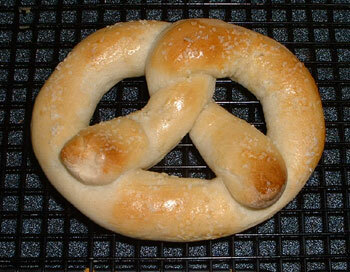 that’s interesting, my pretzel recipe requires a quick poaching before the egg wash, salt and baking. I didn’t know there was any other way. Hi Laura, I believe a lot of pretzel recipes do require a quick dip, along the lines of bagels. It does change the texture somewhat to skip that step, but we still thought these were delicious.